"One of the biggest needs business people have of online government is quick access to clear, consistent and correct information that reduces the time they spend dealing with online government." Attitudes that business people have about dealing with e-government vary according to business size, the survey showed, with the state’s smallest businesses – those with 10 or fewer full-time employees – preferring face-to-face interaction and other traditional means of conducting business with government agencies. “We think for them, it might be a matter of trust,” said Robert Wicks, professor and director of the Center for Communication and Media Research in the J. William Fulbright College of Arts and Sciences. State governments are struggling to keep pace as more business is conducted online. 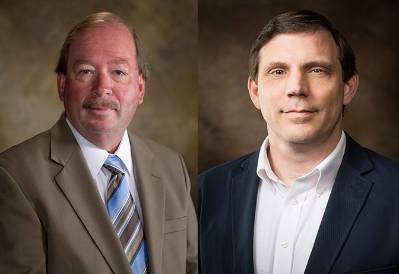 To understand how well it is serving Arkansas businesses and how it can improve services, the state turned to Wicks and his colleague Ron Warren, associate professor of communication. Wicks and Warren surveyed Arkansas business owners to assess attitudes about online services and explore how these data can help the Information Network of Arkansas manage Arkansas.gov. The Information Network of Arkansas is a private company hired by the state to provide online services to Arkansas businesses and residents. Services include tools for paying taxes on online, applying for permits and accessing information about codes and regulations. Wicks and Warren collected data from 368 businesses in Arkansas. Questions focused on access to digital government, interaction between government and business, the need of government services to assist business, and future online interaction between government and business. Although respondents were generally positive about online services, the survey revealed significant differences based on the size of the business. The researchers analyzed and compared data from four groups: very small businesses (1 to 10 full-time employees), small businesses (11 to 20 employees), medium-sized businesses (21 to 50 employees) and large businesses (larger than 50 employees). The smallest and largest Arkansas businesses reported the least confidence with services offered at Arkansas.gov. Respondents for the largest group felt that government websites were less helpful for clearly understanding information about codes, regulations, permits and other matters. These businesses also reported problems with resolving conflicts between state and local regulations and not knowing whom to consult when problems arise. Small- and medium-sized businesses were more confident that their online work with government offices was correct and effective, the researchers found. “We think this is important, because these are the businesses we assume to be poised for growth,” said Warren. The survey revealed no differences based on respondents’ race and ethnicity but did find that businesswomen generally had more positive attitudes about online government than men and were more receptive to the idea of a potential business portal for government services. “One of the biggest needs business people have of online government is quick access to clear, consistent and correct information that reduces the time they spend dealing with online government,” Wicks said. The report can be downloaded at the Center for Communication and Media Research website. Matt McGowan serves as a science and research communications officer for the University of Arkansas.